When Grand Rapids Schools Superintendent Teresa Weatherall Neal visits schools and classrooms, she can't help but notice the empty seats. More than one in four students missed at least 10 days with unexcused absences in 2011-12, one of the highest rates in the state. And some parents and guardians may not even realize when it's happening in their own family. "A child missing a day here, or two days there or three days a month, it really adds up over the course of a year," Neal says. "Instruction is going on every single day, from bell to bell. Even bringing kids in a couple of hours late, or picking them up early -- all of that goes against instructional time." Armed with data and backed by her school board, Neal has launched an all-hands-on-deck effort to boost attendance and, ultimately, lift lives. Billboards and radio ads emphasize the importance of being in school every day. Educators and students are being challenged to do better. New attendance policies start conversations between parents and school officials sooner and nick students' grades when they miss too much school. WHAT’S GOING ON IN YOUR LOCAL SCHOOLS? Check Bridge Magazine’s online database to see how many students are truant in your community. The absentee epidemic in Grand Rapids is by no means unique. Across the state, in alarming numbers, children are tripping on this an important step toward educational success -- being in school ready to learn. According to 2011-12 data obtained by Bridge Magazine, more than 91,000 students missed at least two full weeks of school with unexcused absences. That's enough students to fill Spartan Stadium with another 16,000 milling around outside. The figures come from reports that school districts and charter schools must submit to the state. • The truancy rates for two financially troubled districts on the east and west side of the state were the highest in the state. More than half of the students in Highland Park and Muskegon Heights schools, both operating under state-appointed emergency managers, missed at least two weeks of school without excuses (57 percent in Highland Park, 55 percent in Muskegon). • While the Grand Rapids region is economically booming, poor attendance in Grand Rapids Public Schools is working against the city’s ability to produce a high-skilled workforce that employers need and demand. The school district is one of 10 where more than 25 percent of the students were truant. At the same time, some schools in the Grand Rapids area have strong attendance records and are national models for success. • Most of the state's urban areas have trouble getting students to come to class in satisfactory numbers. The truancy rate in Flint topped 22 percent, and Jackson’s was 23 percent. Detroit reported a much lower truancy rate at 7 percent. Even if that's accurate (and there's no reason to believe that Detroit's absenteeism was three times lower than other cities), that meant 4,600 students missed two weeks of school for unexcused reasons. • Attendance can be a significant problem in rural areas, especially poor ones. More than 36 percent of the students in the Whittemore-Prescott Area Schools in northeastern Michigan were considered truant. More than three-quarters of the families qualify for free or reduced-price lunches because of low incomes. • Many charter schools face truancy crises as well. A few, including Detroit Premier Academy and Mildred C. Wells Preparatory Academy in Benton Harbor, actually reported rates at higher than 100 percent, likely the result of misreporting and/or the influx and outflow of students during the school year. Thirty-one had truancy rates of more than 50 percent. • Some districts, including many affluent suburban ones, reported little or no truancy. The Forest Hills schools outside Grand Rapids reported five truant students among 10,147 enrolled, and Bloomfield Hills in suburban Detroit just 32 out of 12,306. But Kentwood, another metropolitan Grand Rapids district, had 590 truant cases, representing 6.8 percent of its students, according to the data. 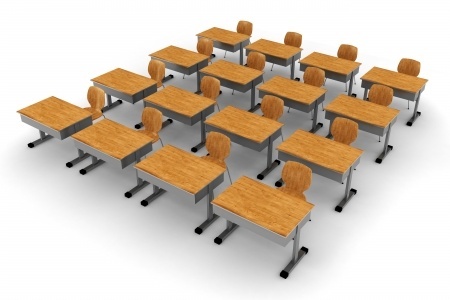 The problem of getting children in their classroom seats and keeping them there is more complicated than the state data suggests. Department of Education officials caution that the self-reporting as well as locally set standards for what constitutes unexcused absences create problems in comparing districts. Beyond that, excused absences are a problem themselves. If parents excuse their children to extend Christmas vacations to get cheaper airfare, to let children take a "mental health day," or to babysit a younger child, the result is the same: lost learning. Because of that, some experts say it's more useful to measure chronic absenteeism (defined as missing 10 percent of the school year, or about 18 days, for any reason). There is no shortage of reasons for students to miss class. They can be bored or bullied, sick or scared. A single mom might ask an older child to stay home to babysit a younger one. A student may be embarrassed for being behind his or her friends or may feel disrespected by a teacher. Attendance also has cultural elements to it. Parents who didn't complete school themselves may place less value on it for their children. And for some Latino families, it is traditional to spend several weeks visiting family in the southwest or in Mexico in the winter. Excessively absent students fall behind, lose interest and are less likely to graduate from high school, let alone go to college or a technical school. They are less apt to end up with the skills to hold good-paying jobs that support a middle class quality of life. Harry Wilson, of the Michigan Council on Crime and Delinquency, tells a story of a single father who sent his child to school on Mondays, Wednesdays, and Fridays when he was at work but not on Tuesdays and Thursdays when he was home. He didn't see the problem until school officials talked to him. The problem is that a chronically absent kindergartner is an unprepared first grader. And on and on. "When students for whatever reason aren't in school, they are more likely to fall behind their cohort, and in middle school and high school, they begin making their own decision not to go because they don't know the content or don't have good friends," said Carol Paine McGovern, executive director of the Kent School Services Network. And ultimately, those who repeatedly miss school are more likely to be headed for lives of crime and end up in prison, which hurts public safety and drains public resources. Experts even have a name for it: the school-to-prison pipeline. That's why Governor Rick Snyder included truancy in his 2012 message on public safety, and launched Michigan's schools-human services collaborative Pathways to Potential initiative in Detroit, Saginaw, Flint and Pontiac, the cities with the highest crime rates. And it's why hundreds of local educators, human services workers, and courts officials convened in Ann Arbor in September to begin a three-year drive to develop local solutions based on what's been proven to work. "The problem has been there for years, but it's a problem we really need to address," Governor Rick Snyder told Bridge magazine after making a presentation to the Michigan Leadership Summit on School-Justice Partnerships. "It's great to see people from the educational system coming together with people from the justice system. Between the two of them, they can do a lot." The good news, Snyder and state and national experts agree, is that there's plenty of clear research about what's effective in improving school attendance. Giving children and families encouragement and support, whether it's to restore utilities or rewarding a child with a perfect-attendance charm for her bracelet -- works. Fear (think Scared Straight) and punishments --especially those that keep kids out of school additional days or hours -- don't. And some of the best models are operating in Michigan. "You have pioneers in your own room doing fabulous work," Hedy Chang, the director of the national group Attendance Works, told summit participants, turning her head toward the table where leaders of the Kent County Services Network were seated. Several years ago, members of the Kent County Family and Children Coordinating Council were examining why school reforms didn't seem to be paying off as they had hoped. They looked at the barriers impeding children's success. And for solutions for addressing them. They concluded that a collaborative effort using the Community School model would bring teachers, students, parents, social workers, businesses and others together working toward the common goal of educating children for a better future. Since then, the effort has transformed 27 schools in seven Kent County school districts. They are much more than schools. They are the hub of their neighborhoods, where services and support are made available to families. Parents are encouraged to volunteer, and some work part time. The poster school is the Sibley School, where truancy dropped from 48 percent to 12 percent in seven years. It went "from worst to near first" among district schools. The Michigan Department of Human Services agreed to move caseworkers from county offices into the schools. That move gives many parents and guardians a reason to come to school and ups the chances that children will be there as well. The case workers are designated as "success coaches" who get to know students and families, become aware of problems early, and work to address them. Attendance is a key focus, according to the program’s executive director, Carol Paine-McGovern. "People didn't have alarm clocks, so we started buying alarm clocks, and we still give them out. If a mother with four children can't walk her children to school, the schools set up walking groups." Through a partnership with Spectrum Health, each school in the program has either a nurse or school-based clinic, improving the likelihood that parents will send a child with asthma or the snifffles to class. Clinical therapists also are in the schools. Sibley School encourages students to come to school through attendance rallies and a Signals for Success program that rewards good attendance. Those who earn green lights for strong attendance qualify for benefits such as holiday food baskets. A room in the building is designated for parental activities, such as cooking and English language classes. Parents have prepared potluck lunches for teachers. The Snyder administration was duly impressed by the Kent County anti-truancy efforts, and Department of Human Services Director Maura Corrigan used it as the model for Pathways for Potential, a program that began with 21 schools in Detroit, Flint, Saginaw and Pontiac in 2012. The schools saw attendance improve by 9 percent in the first year, and Pathways will expand to more than 150 schools this year. The schools are open 12 hours a day, seven days a week and are staffed by community resource coordinators as well as success coaches. DHS has also implemented sanctions, linking school attendance to welfare benefits. Families with truant children can have their Family Independence Program payments reduced or eliminated, which critics say is punishing children. DHS officials say that only 120 cases have been closed, a sign that the program is changing behavior, and that the program is working. "We are not saying cut people off, but examine the circumstances, see what is happening in the family and why the child is not in school," Corrigan said. At the same time, she said, parents have a legal responsibility to get their children to school. In Midland, Probate Judge Dorene Allen sees education as the great equalizer. She has made truancy a top priority since joining the bench in 2001. Her goal is to get students in school and keep them out of court, and she wants to be a convener to make that happen. When she took office, the court had no protocol for handling truancy, and only one truancy officer responsible for 50 schools throughout the county. As a practical matter, it was it impossible for the officer to know children and families personally and to nip problems in the bud. "By looking at the record before I went on the bench, you could see that enforcement was really occurring in April and May, which was too late in the school year," Allen said. So working with the intermediate school district, she deputized a truancy officer in every school -- typically a principal or assistant principal. The truancy officers work closely with students and families to determine why kids are missing school frequently and what can be done. When cases persist, the court schedules truancy conferences, where a youth intervention specialist screens the children and families to determine whether the appropriate services are in place, and works to develop a plan for improving attendance. Most of the time, it works. Of the 70 truancy conferences held in 2012, only 11 led to truancy petitions, where the court can take legal action against the child or responsible adult. Allen, who chairs the Michigan Committee on Juvenile Justice, heard about the success of the Kent School Services Network and dispatched a team for a sight visit. Earlier this year, the model was enacted at two Midland County elementary schools, which saw almost immediate improvement in attendance. The school attendance problem is bigger than truancy, and the school justice summit tackled another key issue: the overuse of suspensions and expulsions, often because of zero-tolerance laws or policies that come down hard on students for a first offense. Students banned from school for extended periods of time end up isolated from their peers and academically behind. Research has shown they are less likely to complete high school and more likely to end up in the juvenile justice system -- the precise outcomes teachers, judges, police officers and taxpayers would like to avoid. While federal law requires expulsions for students who bring firearms to class, Michigan lawmakers have imposed zero-tolerance laws that call for suspensions and expulsions in other cases, including assaults on school employees, weapons other than firearms, and arson. And in cases where local school officials have discretion, they too often don't use it, according to the State Board of Education, among others. Harry Wilson, of the Michigan Council on Crime and Delinquency, advocates a restorative approach, rather than punitive, to help students who misbehave get back on the right track. Young people are more likely to succeed if they are required to perform community service or help out in the school than if they are suspended or expelled. "Anything that takes a kid away from school ends up with that young person more likely to end up in the juvenile justice system," Wilson said. State Court Administrator Chad Schmucker said county judges have discretion in how they approach juvenile cases, and the trend is moving toward restorative justice. "In general, there is less detention than there was 10 years ago," he said. "Cost is a factor, but I also think there is a lot in the literature that says it doesn't really work in all cases." With the close of the school justice summit, state leaders have asked teams from every county to engage educators, judges, law enforcement, social service agencies, parents and students to develop and carry out strategies that get students in their seats and keep them there. Grand Rapids is already on the way. Superintendant Neal launched the attendance challenge at the start of the school year to encourage each school to improve attendance by up to 10 percent. Newsletters went out to parents. Residents read about attendance on billboards and hear it on radio ads and from church pulpits. "You're getting the same message at church, at the grocery store, or at school. Everywhere," said Mel Atkins, executive director of community and student affairs for Grand Rapids schools. "We're getting the community to recognize the importance of attendance and being there on time." I skipped a class in high school one day because the girl I was going with pressured me to do it, I felt so guilty about it that I apologized to the attendance officer in the principles office as I got my unexcused absence slip written out. A self imposed guilt trip stopped me from ever doing it again. Excellent article, and I am glad to see that some districts are having success with programs which reward attendance, rather than simply punish truancy. And now to my soapbox... I believe that the most pressing issue this state faces is its crumbling public school system, and that scares me because it affects so many other problems we face (workforce development, civic improvement, informed discourse, quality of life, etc.). Somehow it has become socially acceptable to demonize teachers, which demoralizes them and adds to the burdens they face. It also gives parents and children permission to disrespect those teachers, which makes it easier to be a truant. We have also chosen as a state to allow funneling our tax dollars out of public schools which are open to all and into independent for-profit charter schools which are less interested in effective education than in making a buck. Further, we make it too easy for people to home-school their children, which only works when parents are incredibly effective and dedicated... a small minority of those who pull their children out of school. And in many areas our schools of choice program is nodding and winking at the reestablishment of de facto segregation, which we worked so hard to eradicate in the 1950s and 60s. I also believe that our strong public school system which started in the 1840s was the reason that our country became the most affluent and influential in the world in the 19th and 20th centuries. Public schools are so much more than places to learn the three R's. They are places for citizens to absorb shared values, develop a sense of purpose and common civic goals, and learn to play well with others. If we lose that, we have lost a lot as a state and nation. Just my opinion, of course, but one based on years of study and firm conviction. Well said, JR! Keep speaking up for public schools. Our future depends on it. As an elementary teacher, I love your response. This is a great article and a constructive reply. Thank you! It seems hypocritical for Gov. Snyder to be interested in truancy since there is no longer a requirement to even send your child to school. Mandatory attendance laws only apply if a parent keeps a child enrolled. They can simply claim they are homeschooling, true or not, and pull the child out of school. There is no registry of homeschooling families. Some kids are forced to stay home and babysit younger siblings or never enter school in the first place. This is all in the name of keeping government out of private lives. Unfortunately, this will lead to adults with no skills. Government will be involved then...in the form of prison or social services. I agree with everything written above; however, I have to add one point that applies to some students. I taught in a community college with a very diverse student population from 16 year olds to 60 year olds and every ethnic group that you could imagine. Most of the time it was really interesting and a bonus to have diversity. I have to add though that there were some students that you really wished would stay at home. Sometimes they were there to have a party and talk with their friends. Sometimes students were disruptive and sometimes threatening to other students, etc. Out of 5 classes, there was usually one with disruptive students. I can imagine that the same issues would apply to high school students. 91,000 sure sounds like a LOT. But with ~1,550,000 enrolled K-12 statewide, is <6% truancy disastrous? The fact is, 94% of the state's pupils are NOT chronic truants. This is an excellent article; one of the best I have seen in Bridge. But the article would have been more informative if it had included a histogram showing what percentage of districts fell within a given range of truancy. And scatterplots showing the relationship (if any) between truancy rates and educational success, and truancy rates and percent of students receiving free or reduced price lunches would have been illuminating. The author says, "While the Grand Rapids region is economically booming, poor attendance in Grand Rapids Public Schools is working against the city’s ability to produce a high-skilled workforce that employers need and demand." But is Grand Rapids itself booming? What is the poverty rate in Grand Rapids? Mr. Andrews says, "Since then, the effort has transformed 27 schools in seven Kent County school districts." What is the socioeconomic status of these schools? How much have test scores improved in these schools? Are there any schools of similar status where the program hasn't made a significant difference? The article says, "Families with truant children can have their Family Independence Program payments reduced or eliminated, which critics say is punishing children." The Economist magazine said that Brazil found that this policy - reducing or eliminating the allowance for the poor - was an effective method of improving school attendance. Mr. Andrews is absolutely right when he says of truancy rates that, "They are disproportionately high in urban areas with high poverty rates, where children and families cope with a wide range of issues including transportation, health care, and gaps in parenting skills that can create barriers to attendance." It is very likely that all of these problems are the result, to a large degree, of a lack of character strengths and virtues on the part of the people involved. That said, the programs described here, particularly the Community School model are effective in significantly improving the situation, and should be supported. These people require extra support and hopefully it won't be structured in such a way that it that it traps them in their current situation. A recent article in the Economist noted that means tested welfare programs can result in marginal tax rates as high as ninety-five percent as people get better jobs and incomes. We need to distinguish between "truancy" and "absenteeism". The term truancy is usually reserved for older (teen) students- those who decide not to show up, and skip class/school. In this article it seems as if truancy is used as a synonym for absenteeism. I'm not sure if Governor Snyder meant to only focus on the teen population - but by using the term truancy, some of the policy discussions have focussed only on the teen issue and have excluded the absenteeism among younger students - caused by parental "educational neglect". In many states "educational neglect" falls within the DHS/CPS (Child Protective Services) portfolio. School administrators report chronic absenteeism to CPS - an easy procedure involving a phone call and the completion of one form. In Michigan, this is not the case, in fact DHS and CPS have actively campaigned against adding educational neglect to the CPS laws - arguing this would increase their workloads too much. In my opinion, this is a very short-sighted policy. After all, if the family is so chaotic that they can't get their kids to school regularly, there are - guaranteed - other issues going on as well. Instead, in Michigan, school administrators who want to pursue absenteeism problems have to follow a much more labor intensive process - and, if their attempts at reaching parents fail, the case ends up in the Prosecutor's Office as a misdemeanor (with mandatory jail time!). From what I hear, most of our state prosecutors do not believe this is the appropriate way to address educational neglect. Moving educational neglect to CPS would have a much broader effect than the DHS policy which only affects low income families receiving cash benefits. First - there are relatively few families receiving cash benefits - and second, it feeds into the stereotype that this is only a problem among low income families. While this article's highlighted local programs are laudable - our state's flawed educational neglect policy must be changed to ensure every child's right to an education is truly realized.